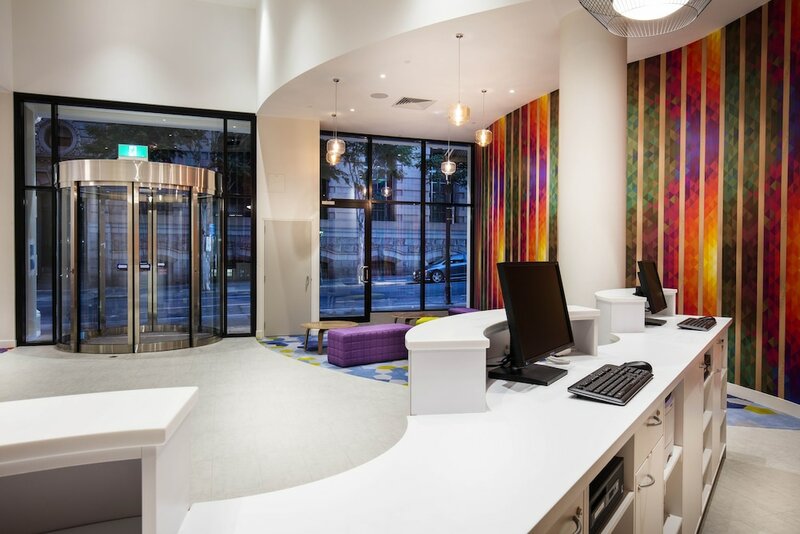 Ibis Styles Brisbane Elizabeth Street is in the heart of Brisbane, within a 5-minute walk of Brisbane Square Library and Queen Street Mall. This 4-star hotel is 0.2 mi (0.3 km) from Wintergarden. Make yourself at home in one of the 367 air-conditioned rooms featuring refrigerators and iPod docking stations. 40-inch LED televisions with cable programming provide entertainment, while wireless Internet access (surcharge) keeps you connected. Bathrooms have showers and hair dryers. Conveniences include phones, as well as laptop-compatible safes and desks. Enjoy international cuisine at The Social all day dining, a restaurant which features a bar, or stay in and take advantage of the room service (during limited hours). Buffet breakfasts are available daily from 6:30 AM to 10:30 AM for a fee. Featured amenities include a business center, express check-in, and express check-out. Planning an event in Brisbane? This hotel has 1561 square feet (145 square meters) of space consisting of conference space and a meeting room. Self parking (subject to charges) is available onsite. Dining options at the hotel include a restaurant and a coffee shop/café. A bar/lounge is on site where guests can unwind with a drink. This 4-star property offers access to a business center and a meeting room. Public areas are equipped with complimentary wireless Internet access. Event facilities measuring 1561 square feet (145 square meters) include conference space. This business-friendly hotel also offers a 24-hour fitness center, laundry facilities, and dry cleaning/laundry services. Limited onsite parking is available on a first-come, first-served basis (surcharge). Ibis Styles Brisbane Elizabeth Street is a smoke-free property. The Social all day dining - This restaurant specializes in international cuisine and serves breakfast, lunch, and dinner. Guests can enjoy drinks at the bar. A children's menu is available. Happy hour is offered. Open daily. Kids stay free! One child 15 years old or younger stays free when using existing bedding. One child 15 years old or younger stays free when occupying the parent or guardian's room, using existing bedding. The property has connecting/adjoining rooms, which are subject to availability and can be requested by contacting the property using the number on the booking confirmation. Parking height restrictions apply.